Back row: (l to r) Coach Marcus Marcic, Ava Marcic, Katarina Duguay, Ellie Fentanes, Sydney Gallant, Coach Brian Arenson. Front row: )l to r) Helen Eichensehr, Emma Bradshaw, Audrey Beaumont-Bent, Maya McKinney. 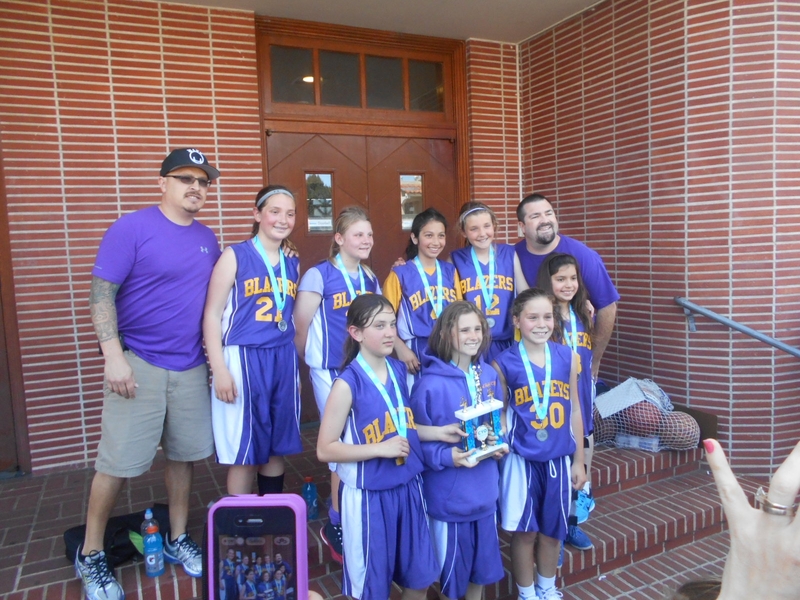 Last year, Good Shepherd fielded two fourth grade girls Catholic Youth Organization basketball teams. Each team won its respective division title. This year, there was only one fifth grade team; it moved up to Division I competition. Faced with unfamiliar teams, the Blazers went to work and won seven out of their eight games. Their loss to St. John’s early in the season proved to consolidate the team, and they worked harder, winning the remaining games and taking a win in the semi-finals. The Blazers went against St. John’s Eagles for the championship. The Blazers were the obvious underdogs facing a strong St. John team again. After their semi-final victory and in light of St. John’s trouncing of their semi-final opponent, Coach Marcus Marcic planned his attack. Equipped with knowledge of the Eagles’ offense, he sought to bolster up the Blazers’ defensive strategy. The Eagle annihilated their semi-final opponent scoring 40 points, with the Eagles’ top contributor scoring a whopping 26 points. If the Blazers had any chance at winning, they needed to shut down the Eagles’ scoring leader. The Blazers had some extended practices the week before the big game. They were ready to go on May 18 to work their hardest to win a Division I title. The game was a slug fest from the get-go. There were turnovers, fouls, points lost and points made. The girls hustled back and forth, Blazers would take the lead, but the Eagles would fly ahead. It was a white knuckle ride for each six minute quarter. In the end, the Eagles prevailed 25-22.